Ah, beef jerky. Long time road trip staple and up-and-coming bar snack. We're pretty big fans of the stuff and figured, why not make a beer spiked version of our own? We marinated ours in our Bruxelles Black, but any sweet, darker Belgian ale will do the trick - and choose the fattier flank steak cut for added moisture. 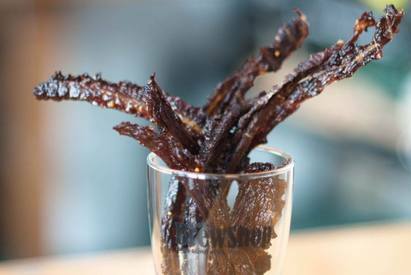 Jerky can be prepared in advanced for your next party or upcoming travels since it keeps in the refrigerator for up to two weeks (and leaner cuts of meat even longer), but ours disappeared in a few hours. We get the feeling yours will too.